In terms of design philosophy, the Fit 13A also deviates from the Duo or Pro. Instead of simply plastic or carbon ﬁber, Sony opted for brushed aluminum, which gives it the premium look that it deserves. Besides looking great, it’s also light and strengthens the whole machine. There is still plastic at the bottom, but it has a soft-touch coat that gives the user a better grip when holding the Fit 13A in tablet mode. especially considering some of the features found within. While everything about the machine looks good, right down to the plastic interior, which has the same shade of silver as the palmrest, its keyboard is a letdown. Since it’s separate from the palmrest, the keyboard displays plenty of ﬂ ex when typing. In our performance benchmarks, the Fit 13A’s PCMark 8 Home benchmark score was only 1,251, despite having the same Intel Core i5 (4200U, 1.6GHz) CPU, GPU (Intel HD graphics 4400), 8GB RAM and 128GB SSD as most mainstream Ultrabooks. In comparison, an otherwise similarly specced Lenovo Yoga Pro with a Core i7 CPU managed a score of 2,924, approximately 80% better. Before you attribute the large margin due to the Yoga 2 Pro’s Core i7 chip, the performance difference between Core i7 and Core i5 mobile CPUs is generally around a 20% average. web browsing, multimedia editing and document editing. 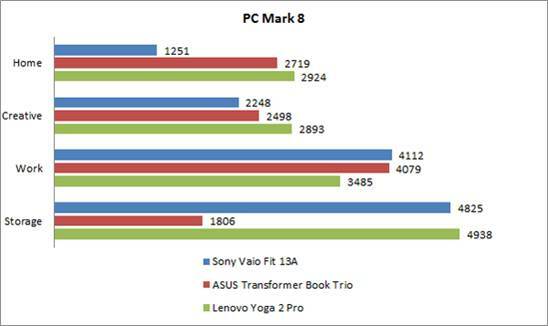 Its 3DMark synthetic gaming benchmark score of 3,078 however, was more on par with other premium Ultrabooks we’ve tested, though the Far Cry 2 gaming benchmark score came out below average at 25.29 frames per second. You’ll get decent general computing and web page rendering with the Fit 13A. As for games, let’s just say that most Ultrabooks with onboard graphics aren’t built for them. What we’ve noticed while conducting our benchmarks, was that Sony neglected cooling in order to make the Fit 13A as thin as possible. While it won’t make much of a difference to many users, especially in tablet mode where you don’t expect the machine to heat up in your hands, the Fit 13A’s small cooling vent to the left isn’t enough to allow the machine’s CPU and GPU to reach their full potential—the same issue that Sony’s Vaio Pro 13 had. Despite this, battery performance on the Fit 13A didn’t overwhelm. It managed a respectable 3 hours and 56 minutes in Powermark, which puts the machine through various multimedia tasks simulating real world usage. If you were working with less intensive applications like document editing or casual web browsing, you may be able to squeeze a full day’s use out of the Fit 13A. 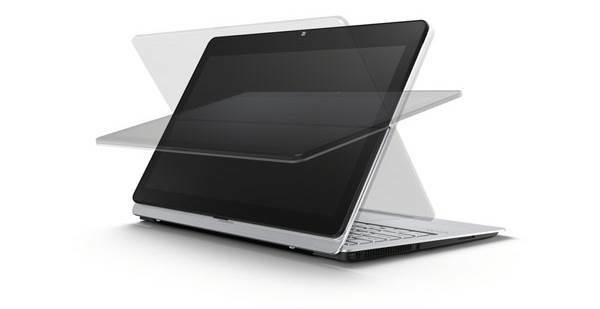 All in, the Sony Vaio Fit 13A is a capable convertible, with a very neat (if not unique) design and use of a digitizer. Users who place emphasis on build quality, functionality and looks will be pleased with the Fit 13A. However, the main issue comes down to value. Its $2,199 (for an Intel Core i5) price tag isn’t that competitive, especially compared against a $2,099 Lenovo Yoga 2 Pro (Intel Core i7), or even in perspective a $1,488 Apple MacBook Air (Intel Core i5), both of which offer better performance and battery life.